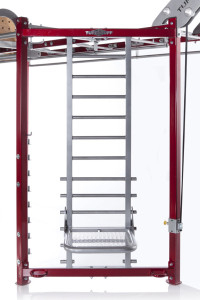 The step up station is one of the most versatile modules on the rack. From simple step exercises to explosive plyometric routines, legs, glutes, core and cardio conditioning explode from this platform. The landing surface is textured for a safe and secure usage from all three angles. The battle rope station is unique to the CT series. Shoulders and arms burn through a favorite of functional training fanatics. 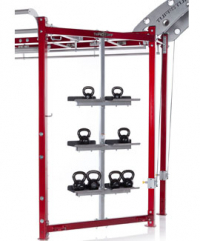 The CT-8000B Base Trainer has an unlimited capacity for functional training in a compact, space saving design. Sure to be the focal point of your fitness program each rack accommodates distinct training modules for fitness excellence. 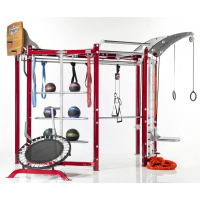 Built for work and play, the monkey bars, fat grip chins and parallel suspension bars create a platform to develop upper body and core strength. The adjustable horizontal bar station can be used for assisted push ups, pull ups and extended flexibility training. Adjustability gives old school ring movements a new school twist working balance and endurance on a series of dynamic body weight applications. A smart pegboard supports core stability, arm strength and upper body endurance while doubling as a high re-bounder. 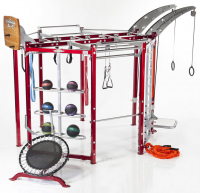 The CT-8100E Elite Trainer has an unlimited capacity for functional training in a compact, space saving design. Sure to be the focal point of your fitness program each rack accommodates distinct training modules for fitness excellence. Built for work and play, the monkey bars, fat grip chins and parallel suspension bars create a platform to develop upper body and core strength. The CT Series is the only multi-use rack with a full size heavy bag option. 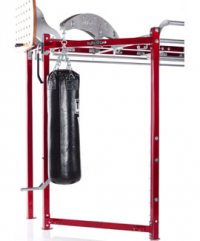 Built tough to handle an 80 or 100 pound heavy bag without dominating the rest of your functional training system, cross trainers and self defense enthusiast will appreciate this addition to their routines. Kettle bell training forces the entire body to perform functions that build strength while engaging multiple muscle groups simultaneously. 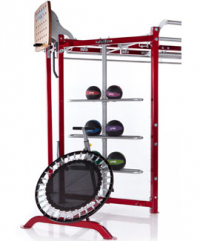 The Medicine Ball Rebounder works core, coordination and overall cardio endurance. 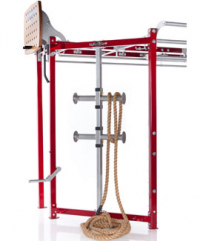 The popularity of strap and suspension-based training has taken the fitness world by storm. The CT series sports a multi-strap training boom that can accommodate the versatile CrossCore 180 Rotational Bodyweight trainer. The CT8 is the perfect training system for clubs and studios looking to save cost and floor space, while maximizing their training options for revolutionary gains in revenue and profitability.